The Spokane Valley–Rathdrum Prairie (SVRP) aquifer is the sole source of drinking water for over 400,000 residents in Spokane County, Washington, and Bonner and Kootenai Counties, Idaho (fig. 1). The area includes the rapidly growing cities of Spokane, Spokane Valley, and Liberty Lake, Washington, and Coeur d’Alene and Post Falls, Idaho. Recent and projected urban, suburban, and industrial/commercial growth has raised concerns about potential future effects on water availability and water quality in the SVRP aquifer, and Spokane and Little Spokane Rivers. Water resource concerns include growing demands on ground water, low streamflow in reaches of the Spokane and Little Spokane Rivers, and water quality problems associated with changing land use activities. Water resource demands are increasing at a time when aquifer and river dynamics are not well understood. This understanding is essential in making proper management decisions concerning ground water and surface water appropriations in the SVRP area. Management of the SVRP aquifer is complicated by the interstate, multi-jurisdictional nature of the aquifer. The States of Washington and Idaho have primary responsibility for water allocation and water quality. However, local governments increasingly are being called upon to consider water supply and quality implications in land use planning. Aquifer management also is complicated by the interconnection between ground water and surface water; ground water exchanges with surface channels may influence surface channel flow rates and surface-water quality. The SVRP aquifer primarily consists of thick layers of coarse-grained sediments–gravels, cobbles, and boulders–deposited during a series of outburst floods resulting from repeated collapse of the ice dam that impounded ancient Glacial Lake Missoula (Bretz, 1930). Sources of recharge to the aquifer include infiltration from precipitation, return flow from water applied at land surface, leakage from the Spokane and Little Spokane Rivers and adjacent lakes, and surface- and ground-water inflow from tributary basins. 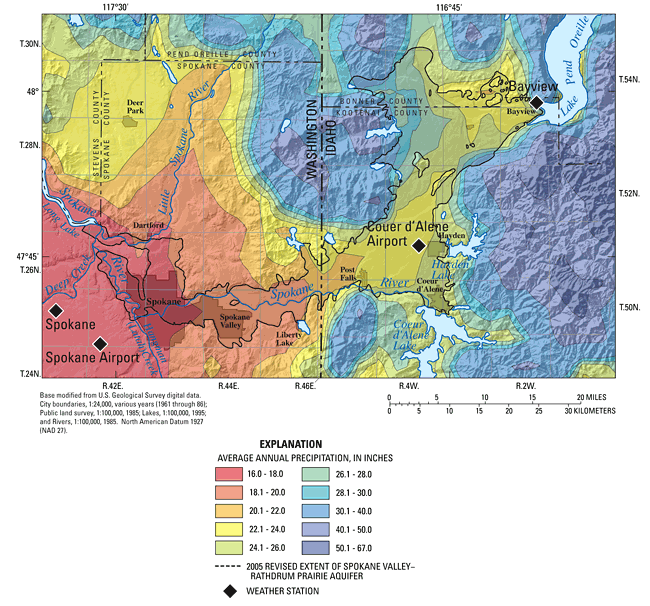 The aquifer discharges into the Spokane and Little Spokane Rivers and through withdrawals from wells. The aquifer was designated a “Sole Source Aquifer” by the U.S. Environmental Protection Agency (USEPA) in 1978 (under the provisions of the Federal Safe Drinking Water Act of 1974) in response to local concerns about aquifer vulnerability to water quality degradation. The USEPA defines such an aquifer as one that supplies at least 50 percent of the drinking water consumed in the area overlying the aquifer (U.S. Environmental Protection Agency, 2000). Communities depending on a sole-source aquifer generally do not have a viable alternative drinking-water source. Figure 1. Location of the Spokane Valley–Rathdrum Prairie aquifer, Spokane County, Washington, and Bonner and Kootenai Counties, Idaho. Water management issues in this rapidly growing bi-state area have increasingly become regional in nature. Several groups, therefore, have initiated a comprehensive, regional study of the SVRP aquifer to serve as a scientific basis for addressing regional water concerns. 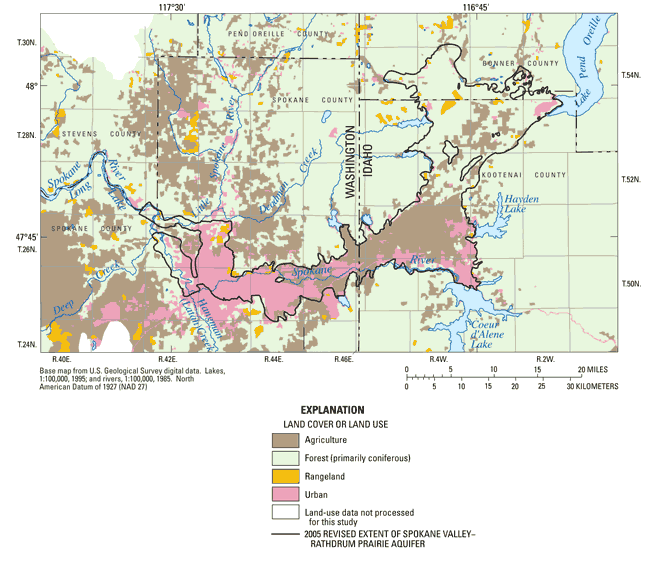 In 2004, the Washington Department of Ecology (WDOE), the Idaho Department of Water Resources (IDWR), and the U.S. Geological Survey (USGS) in consultation with local stakeholders developed a comprehensive work plan for a study to gain a better understanding of ground water and surface water resources in the SVRP study area. The initial study objective is the development of a comprehensive data set to provide an improved scientific basis for water management of the SVRP aquifer. A concurrent phase of the study will include the construction of numerical ground- and surface-water flow models to support the conjunctive management of ground and surface water in the SVRP area. The results of this study are intended to provide tools to evaluate alternative water resource management scenarios. This document, summarizing the current (2004) understanding of the hydrogeologic framework, existing ground-water flow models, water-budget components, ground-water/surface-water interactions, and data needs, is one of several reports that will be produced during this study. The first report produced during this study summarized the long-term trends in discharge of the Spokane River (Hortness and Covert, 2005). The next report described a water-level map of the aquifer for September, 2004 (Campbell, 2005). Future reports are planned that will document the updated conceptual model of the aquifer and the numerical flow models that are the final products of this investigation. This report provides a summary of geologic, hydrologic, and ground-water flow modeling information available as of June 2005 for the SVRP aquifer. As such, this information is directly relevant to the construction of the flow model being developed for the SVRP aquifer. Based on available data, the needs of the models, and the data gaps identified, it may be determined that additional hydrologic and (or) hydrogeologic data would be helpful in reducing uncertainties associated with the numerous data requirements of the models. The purpose of this report is to present the current knowledge base regarding the physical nature of the SVRP aquifer that in turn, can be used by the States of Washington and Idaho in order to evaluate the adequacy of available data for the construction of the models and to guide additional data collection. This report describes previous investigations including the current understanding of the hydrogeologic framework, surface geophysics, water budget components, ground-water/surface-water interactions, and ground-water flow modeling in the SVRP aquifer study area. The scope of the report includes the regional and local geologic history, the surficial and subsurface geology, the physical characteristics of the aquifer and adjacent units, ground-water flow directions, summaries of surface- and ground-water withdrawals in the study area, estimates of ground-water recharge, and a description of the ground-water/surface interaction between the Spokane River and the SVRP aquifer. Additional data needs that would allow for a more refined understanding of the area’s water resources also are provided. The SVRP aquifer underlies about 370 mi2 of a relatively flat, alluvium-covered valley surrounded by bedrock highlands (pl. 1). 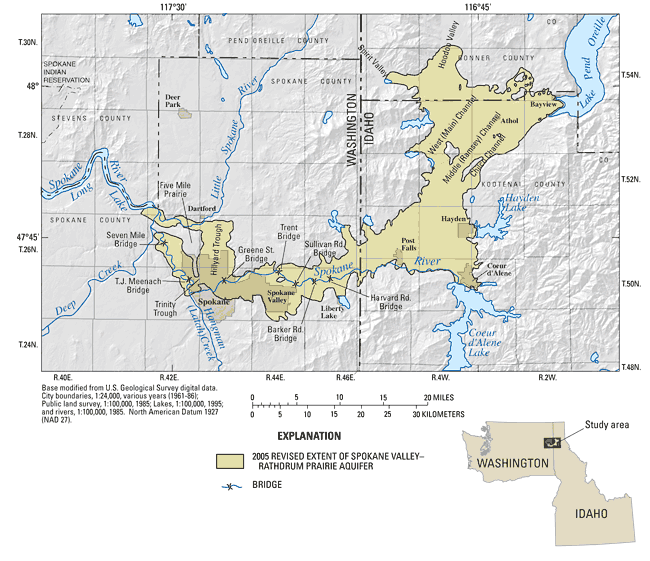 The aquifer extends south from Lake Pend Oreille to Coeur d’Alene Lake and westward across the Washington−Idaho state line to near Nine Mile Falls northwest of the City of Spokane. Land surface altitudes of the valley range from about 1,500 to nearly 2,600 ft above the National Geodetic Vertical Datum of 1929 (NGVD 29). Several lakes are located along the margins of the aquifer, the largest of which are Coeur d’Alene Lake and Lake Pend Oreille in Idaho (pl. 1). The valley generally is void of surface drainage other than the Spokane and Little Spokane Rivers (pl. 1). Ground water is the primary source for public supply, domestic, irrigation, and industrial water use in the area (Hutson and others, 2004). In 2000, estimates of ground-water use in Spokane, Kootenai, and Bonner Counties were more than 188 Mgal/d (Hutson and others, 2004). Although these estimates include entire counties, which extend beyond the area of the SVRP aquifer, the majority of the ground water used in those counties is derived from the SVRP aquifer. In Spokane County alone, estimates of ground-water use in 2000 were about 110 Mgal/d for public supply, 12 Mgal/d for domestic use, 9 Mgal/d for irrigation, and 8 Mgal/d for industrial use, accessed September 2004 at http://water.usgs.gov/watuse/data/2000/. Peak summer daily ground-water withdrawals from the SVRP aquifer are estimated to be about 450 Mgal/d (MacInnis and others, 2000). Primary land-use types overlying the SVRP aquifer include agriculture and urban (Nakagaki, Hitt, and McNamara, U.S. Geological Survey, written commun., 2001) (fig. 2). Agricultural land is predominantly used for hay production, wheat, grass seed, barley, oats, and for pasture. Urban areas supplied by the aquifer include the Spokane metropolitan area in Washington and Coeur d’Alene and Post Falls in Idaho. Residential and commercial development is rapidly increasing in the area as evidenced between the 1990 and 2000 censuses, with a 16 percent population increase in Spokane County, Washington and nearly 56 percent increase in Kootenai County, Idaho (U.S. Census Bureau, 2002). The upland areas surrounding the aquifer area primarily are covered with coniferous forests and residential housing. Figure 2. Generalized land cover or land use in the Spokane Valley–Rathdrum Prairie area, Washington and Idaho. Climate in the study area varies from subhumid to semiarid with warm, dry summers and cool, moist winters (Molenaar, 1988). Mean annual (1971-2000) precipitation at weather stations in the area were 16.7 in/yr at the Spokane Airport, Washington, 25.9 in/yr near Bayview, Idaho, and 28.1 in/yr at Coeur d’Alene Airport, Idaho (Western Regional Climate Center, 2005). Most precipitation falls as snow from November through March (Molenaar, 1988). The distribution of average annual precipitation for 1961-90 in the study area is shown in figure 3. Figure 3. Average annual precipitation based on 30 years of record, 1961–90, in the Spokane Valley–Rathdrum Prairie area, Washington and Idaho. This report was completed with the assistance of many individuals and groups. The authors thank the members of the Spokane Valley–Rathdrum Prairie Aquifer Technical Advisory Committee who provided technical insights, historical and recent data, and guidance on data collection needs. Private landowners; water purveyors; city, county, and State agencies; consulting firms; and local colleges and universities provided access to private property, data, special collections, and (or) field assistance that was invaluable in completing this report. The staff of the Post Falls, Idaho, and Spokane, Washington, USGS field offices provided ongoing support for field data collection as well as coordination and planning required by the project. For more information about USGS activities in Washington, visit the USGS Washington District home page .